Bose SoundLink III is latest Bluetooth speaker | What Hi-Fi? 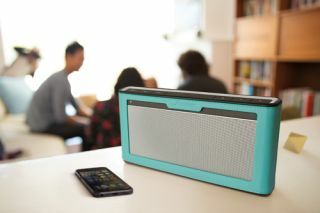 Latest addition to acclaimed SoundLink portfolio boasts all-new design and longer battery life to deliver "new level of audio performance"
More than two years after it first launched the SoundLink range of wireless Bluetooth speakers, Bose has expanded the series with the unveiling of the new SoundLink Bluetooth speaker III. Bose says the SoundLink III is its best-performing wireless speaker to date, with an all-new design and a longer battery life delivering what it claims to be "a new level of audio performance". You will be able to stream music from your smartphone, tablet and other devices wirelessly via Bluetooth A2DP, allowing you to share your favourite tracks with others wherever you may be. Four neodymium transducers and dual-opposing passive radiators work in combination with a new digital signal processing algorithm and enhanced electronics to offer louder playback. The design of the SoundLink III has been inspired by the SoundLink Mini. A silicone button panel protects from dirt and dust, while it also has a wraparound metal grille that "resists fingerprints". Meanwhile, new Bluetooth LED signal lights are designed to make pairing or switching Bluetooth devices easier. The six most recently used devices will also be stored in the SoundLink III's memory. In terms of dimensions, the SoundLink III weighs in at just 3lbs. It stands 5in high, 10in wide and 2in deep. The rechargeable battery gives up to 14 hours of listening, so you can play music all day! The SoundLink III is now available for £259.95. Want to personalise the speaker further? Five coloured accessory covers – orange, green, blue, grey and pink – are available for £29.95 each. If this latest addition to the SoundLink Bluetooth speaker portfolio follows in the footsteps of predecessors like the Mini, Air and original SoundLink, then we're definitely looking forward to testing it out!